Thanks for an easily understood explanation for the QTM! I bet you thought I made a spelling error in the title above (Got ya!) I am a terrible typist. I often type too fast and hit the keys out of sequence, and have often attempted to type the word “inflation” and instead type “infaltion”. The other day I did it, and it hit me that this misspelled word perhaps could be interpreted as a compound word meaning “false inflation” or a new word that represents the concept that the entire monetarist or quantity theory concept of inflation is FALSE. Well that might be a good new word to add to the lexicon of truth, because the monetarist concept of so-called “inflation” is false under a state currency system that is free floating and non-convertable. There is NO SUCH THING as “inflation” any more; at least as it is defined in the monetarist’s view. Importantly though they never can. Because banks don’t lend central bank money. Central bank money always sits at the central bank doing nothing much. It merely shuffles between those entities that have central bank accounts based on their clearing needs. The quantity of Bank lending is always determined by their credit licence – which in the current system is related to the amount of capital a bank has. It is only the price of lending that can be influenced by the Central banks. So bank lending is always limited by price, not quantity. Not only has this experiment shown QTM to be baloney, but it has proven the endogenous theory of money as well. The amount of money in the system is dynamic based on demand at the current price. Keynes had a good line about QTMers – they think you can gain weight by wearing a bigger belt. 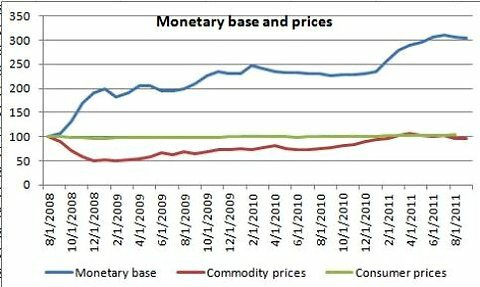 Just because inflation may require an increase in base money does not mean that increasing base money will cause inflation. Right-o, Max! As has been said before, hyperinflation causes money printing, not the other way around. The recipe for hyperinflation is rather more difficult than we’ve been led to believe. One of the key ingredients is substantial debt in a foreign currency; another is destruction of productive capacity. It would appear that in order to create inflation the treasury would have to print physical dollar bills by the trillions to pay off the massive debt overhang. Hear any helicopters overhead lately? I contend that if there is money waiting in the wings for a recovery then putting money in the consumers hands will be necessary because we are too early in cycle for enough politicians to run from career ending austerity. The sooner the helicopters fly the better! Good to find like-minded economists on the web. Must be stressful being an “inflation-phobe” these days. Glad I’m not.